Again I have been caught slightly off guard with a new award which has just started making the rounds. I am always left a little speechless that: A) I am nominated in the first place. B) I have regular visitors to my little ‘ol blog that to be fair has a rather limited market of appeal. With pleasure I can say a big thank you to Dana from http://atlastracer.wordpress.com who kindly nominated me for the award. It’s hard to single out just 10 that I wish to award, I know that at least one of my nominations already has this award. So if you’re not chosen it’s nothing personal and the others I would like to nominate don’t accept awards. If I have nominated you and you do not wish to continue with the award, or don’t have the time to do this award thing then I take no offence at all. 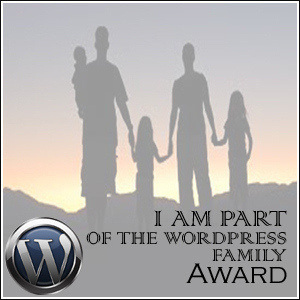 I just wanted to show 10 blogs that I appreciate them, it’s a shame I can’t award all of the blogs I follow. I really don’t like doing this list thing as I follow all my blogs and read them for a reason, so I have chosen the list below on the basis of interaction and the general feel-good factor of the blogs in no particular order. Yes there is the petrol infused car stuff as you would expect but a few surprises too. 1) Dana from http://atlastracer.wordpress.com/ – I know you nominated me, but if I had this from somebody else I would have nominated you. 2) Debbie from http://hoodscoop03.com/ – my blog buddy from across the pond who shares the Mustang love. 3) Ron from http://ronscubadiver.wordpress.com/ who takes some superb photos and shows me places I wanted to go from all angles. 4) http://stagownersclub.wordpress.com/ – I always wanted a Mustang, but I said if I couldn’t have a Mustang I would have a Triumph stag, I can feel the passion from these guys and their cars too. 5) http://www.rodalena.com/ – just an enjoyable varied read who has followed me for a long time now. 6) Alicia from http://aliciabenton.wordpress.com/ – I just reading this blog. 7) Karen from http://karengadient.com/ – some wonderful things with Photoshop. 8) http://f1superswede.wordpress.com/ – If I ever need info on the F1 scene here it is. 9) Jim from http://harbin77.wordpress.com/ – A genuine nice guy who owned a Mustang! 10) http://storysmitten.wordpress.com/ – A great set of snippets from stories here. A special mention to all the photo blogs I follow too, the world becomes a much smaller place when I see your pictures. This entry was posted in Blog, General and tagged awards, blog, F1, Mustangs, wordpress family award. Bookmark the permalink. Not sure if its the right thing but nominated you too!!! Wow, thank you so much for the mention, we are only 4 months into our blog journey and still learning. Blown away with the number of folks that read our little ramblings – will try and keep it up!! Thank you for the shout-out, Mart. I’m glad to know you.